The Amazon Kindle Fire tablet is displayed at a press conference in New York on September 28, 2011. Online retail titan Amazon announced Thursday it is expanding sales of its Kindle tablet computers to "over 170 countries and territories around the world," and its Appstore in nearly 200 countries. Online retail titan Amazon announced Thursday it is expanding sales of its Kindle tablet computers to "over 170 countries and territories around the world," and its Appstore in nearly 200 countries. The move steps up the offensive of Amazon against rivals like Apple and Google in the market for tablets and content sold for the devices. "Kindle Fire HD is the number one best-selling item in the world for Amazon since its launch, and we're thrilled to make it available to even more customers around the globe today," said Dave Limp, vice president at Amazon Kindle. "Not only does Kindle Fire feature advanced hardware, it's also a service. When combined with our content ecosystem, great email and browsing and top-rated customer service, we hope people around the world will agree that Kindle Fire HD is the best tablet for an incredible price." Amazon said Kindle Fire, which start in the US market at $159, will start shipping to the additional countries by June 13. Up to now it had been sold outside the US only in Britain, Germany, France, Italy, Spain and Japan. The company said its Amazon Appstore "is now available to millions of customers in nearly 200 countries," offering games, books, and other content. Amazon sells apps for Kindle, but also for PCs and other Android phones and devices. "We think our customers will love the app selection we have to offer and also find features such as Free App of the Day and personalized recommendations very helpful as they discover and explore new apps and games," said Amazon's Mike George. "By further expanding the distribution of apps to millions of customers around the world, we are continuing to make it easy for customers to enjoy their Amazon apps on Kindle Fire and any Android device." The Appstore was launched in 2011 and prior to Thursday was only in Britain, Germany, France, Italy, Spain, China, Japan and the United States. Amazon is competing with the likes of Apple and Google in the market for tablets and also online content and apps. Some reports say Amazon is developing its own smartphone as well. The Seattle-based firm has not released sales figures but research firm IDC said Amazon is the fourth leading seller of tablets despite limited distribution, with 1.8 million units sold in the first quarter. Amazon is likely using Kindle to globally expand its power as an online retailer, according to Silicon Valley analyst Rob Enderle. 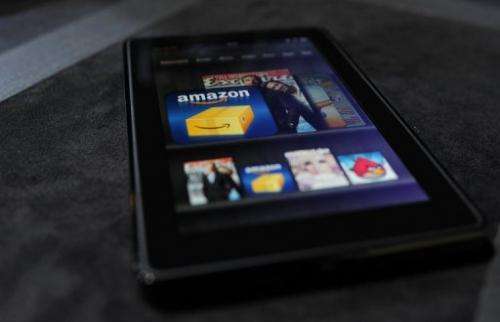 "They are selling digital storefronts," Enderle said of putting Kindle tablets into the hands of people around the world. "The Kindle is a window into Amazon," he continued. "It is about much more than eBooks, music and movies; once you are there Amazon wants to sell you televisions, refrigerators, stereos and more." Even when sold at a loss, Kindle tablets power a profitable "ecosystem" for Amazon with sales of digital media boasting attractive margins , Morgan Stanley said in a note to investors. "Amazon could lose money on every Kindle they sold and it would still be a great deal for Amazon," Enderle said. A challenge for Amazon will be getting retailers around the world to embrace peddling Kindle tablets that will compete for customers' cash once in their hands, according to the analyst. "Amazon still has to sell Kindles in places where they are not big," Enderle said. "If I am a retailer in South America, do I really want to sell someone a doorway into Amazon?"